Lantheus Presents New Data on the Effectiveness of Novel PET Cardiac Imaging Agent Flurpiridaz F 18 in Obese Patients with Suspected Heart Disease at ACC Scientific Session | Lantheus Holdings, Inc.
NORTH BILLERICA, Mass.--(BUSINESS WIRE)--Apr. 4, 2016-- Lantheus Holdings, Inc. (NASDAQ: LNTH), the parent company of Lantheus Medical Imaging, Inc. (“LMI”), a global leader in the development, manufacture and commercialization of innovative diagnostic imaging agents, today announced that new data from a sub-analysis of its first Phase 3 study of flurpiridaz F 18 for myocardial perfusion imaging (MPI) in obese patients will be presented at the American College of Cardiology’s Annual Scientific Session today in Chicago. The findings show the superiority of flurpiridaz F 18, an investigational positron emission tomography (PET) agent for MPI, compared to MPI with single photon emission computed tomography (SPECT) for the assessment of coronary artery disease (CAD) in patients with a body mass index (BMI) of 30 or higher. The moderated poster entitled, “Improved Assessment of CAD in Obese Subjects with Flurpiridaz F 18 PET Myocardial Perfusion Imaging: A Subset Analysis of the Flurpiridaz F 18 301 Phase 3 Study,” will be presented by Timothy Bateman, M.D. of Mid America Heart Institute onMonday, April 4, 2016 at 9:45 a.m. CT in the Non-invasive Imaging session of the meeting. Based on a blinded read of PET and SPECT data, flurpiridaz F 18 PET imaging demonstrated a statistically greater sensitivity (71.1%) versus SPECT (51.7%) (p<0.001) and similar specificity (79.8%) versus SPECT (77.5%) (p=0.002 for non-inferiority testing). The diagnostic superiority of flurpiridaz F 18 PET imaging versus SPECT was demonstrated by ROC analysis (p<0.001). A significantly higher percentage of images were rated as either excellent or good quality with flurpiridaz F 18 PET imaging, compared to SPECT for stress images (p<0.001) and rest images (p<0.001). Diagnostic certainty of interpretation (the percentage of cases with definitely abnormal or definitely normal interpretation) was significantly higher for flurpiridaz F 18 PET imaging compared to SPECT (p<0.001). No drug-related serious adverse events were observed. Importantly, radiation exposure associated with flurpiridaz F 18 PET imaging was reduced to less than 50% of that associated with standard SPECT. The data are from a multicenter, international (United States, Canada, and Finland) Phase 3 study of flurpiridaz F 18 PET imaging. The study enrolled approximately 800 patients with known or suspected CAD who were scheduled for coronary angiography and conventional SPECT. Of these patients, 413 obese patients with a BMI ≥30 and suspected CAD underwent both rest and stress flurpiridaz F 18 PET and SPECT imaging and coronary angiography. The subset had a mean BMI of 35±6 with a range of 30-87. Flurpiridaz F 18 PET imaging was performed at rest and during pharmacologic or exercise stress testing. Lantheus is poised to commence the second of the two Phase 3 trials for flurpiridaz F 18 PET imaging with a revised protocol in place under an FDA-approved Special Protocol Assessment and is in active discussions with prospective strategic partners for completion of the development and commercialization of this promising agent. 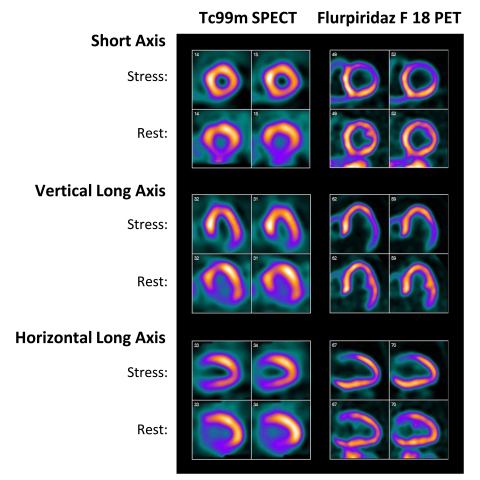 Flurpiridaz F 18, a fluorine 18-labeled agent that binds to mitochondrial complex 1 (MC-1)1, was designed to be a novel PET imaging agent that may better evaluate patients with known or suspected CAD, which is the most common form of heart disease2, affecting an estimated 15.4 million Americans 20 years of age or older3. CAD is the leading cause of death in the United States for both men and women2. Each year more than 400,000 Americans die from CAD2. In the first phase 3 study, flurpiridaz F 18 demonstrated improved CAD detection and reduced radiation exposure over standard SPECT. In subgroup analyses, the risk-benefit profile of flurpiridaz F 18 PET imaging appeared to be favorable in women, obese patients and patients with multivessel disease. It is important to note that, with a 110 minute half-life, flurpiridaz F 18 can be used in conjunction with treadmill exercise, which is not feasible with other currently used PET tracers for MPI. 2National Institutes of Health, National Heart, Lung, and Blood Institute. Coronary Artery Disease: Who Is At Risk. http://www.nhlbi.nih.gov/health/dci/Diseases/Cad/CAD_WhoIsAtRisk.html. Accessed April 2016. 4 Radiology Info. What is Positron Emission Tomography – Computed Tomography (PET/CT) Scanning. http://www.radiologyinfo.org/en/info.cfm?pg=PET. Accessed October 2015. 5National Institutes of Health. NIH Clinical Center. Positron Emission Tomography Department Overview. http://clinicalcenter.nih.gov/pet/. Accessed April 2016.